Healthcare organizations currently implementing Six Sigma are finding no shortage of opportunities for applying this approach – and many are reaping substantial benefits in terms of cost, quality and productivity. One area increasingly targeted in recent years has been the cardiac catheterization lab, which is generally a high-volume, challenging and complex environment within any healthcare facility. When the University of Pittsburgh Medical Center (UPMC) began working on improvement initiatives, the cath lab surfaced as an area of opportunity, given recent changes in patient flow and efficiency. With the type of resource constraints facing many hospitals today, the hospital knew that growth in terms of additional space and staff was not possible at that point, so it sought alternate options for meeting demand and generating additional revenue. Short Term – Identified opportunity to redeploy staff and utilize holding area to reduce room TAT by 15 minutes. Brought in-room wait and room TAT to specification levels. Long-Term – Identified opportunity to modify scheduling practices that reduce total case time, and improve patient throughput. A Six Sigma team was formed and launched a DMAIC (Define, Measure, Analyze, Improve, Control) project to look at the volume of cath lab cases and how they might improve capacity and revenue while decreasing costs. As part of the initial Define phase of the project, the team set clear objectives for improving workflow in the lab and removing any unnecessary roadblocks from existing processes. In the Measure phase, the team began to closely examine and measure all aspects of cath lab performance including pre-case, exam time, and post-case processes to determine impact on patient scheduling, overtime and capacity. It collected cycle-time data for analysis, beginning from the time the patient enters the room. Factors such as how the patient enters the system, when the cath lab is prepared and the time it takes to prepare the patient for the procedure were taken into account. By analyzing the data, the project team found that patients were often in the lab earlier than necessary – on average 14 extra minutes – from the time they entered until they were ready for draping, scrub and IV preparation. This additional 14 minutes was identified as wasted time, and the project focused on identifying and eliminating the root causes for the variation and delay. Analysis of the data during the Analyze phase also revealed that although two hours were blocked for each procedure, the actual case time was only 55 minutes – less than half the total time the patient was in the room. To reduce room turnaround time, they set a target of 10 minutes for cases to start on time, with a beginning baseline average of 22 minutes. They were able to bring this into specification levels through Six Sigma and process changes implemented during the Improve phase such as redeploying staff and using a holding area for patients. Along with Six Sigma, the use of change management tools helped; the team create a shared need and build acceptance. Members of the staff at UPMC realized they had a great opportunity for improving the capacity of the cardiac cath lab and remained engaged in this initiative. They managed the project closely, with oversight from the director of the lab, who supported the effort and sought to remove any barriers staff identified. As part of this process, it was clear to staff from the beginning that there was a possibility they might end up reducing personnel. At the time this project began, UPMC had roughly a 50 percent turnover rate in nurses and vacancies with lab technicians. By improving workflow, redeploying some of the staff and not filling existing vacancies, however, they were able to avoid eliminating anyone from the center’s workforce. The staff is not feeling that same sense of being stretched too thin, and job satisfaction has gone up. With the added efficiencies, UPMC found it needed only four labs instead of five. 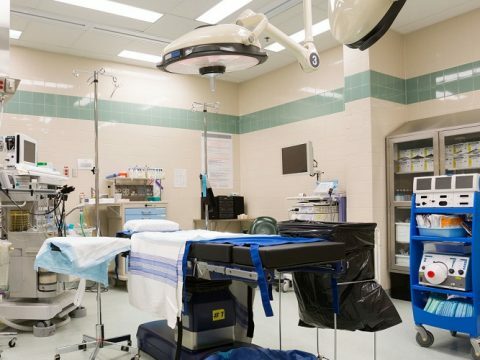 At the start of the project, the post-procedural area had contributed to delays because there were not enough beds available for patients, but this process was streamlined. The team also significantly reduced pre-procedure waiting time. UPMC has been able to add a case per day, and the added capacity translates to potential financial impact of an additional $5.2 million per year in revenue. The changes also are helping to improve services for patients, and staff mentioned that this is almost a reinvestment in the lab. The “in-room wait time” began with a baseline of 33 minutes total time. As the project entered the Control phase, this had been reduced to 4.8 minutes. The lab also went from a turnaround time of 51 minutes to 20 minutes, and the physician response time did not change much. Key: ++Strong Improvement/Statistically Significant, + Improvement/Not Statistically Significant, – Negative Movement/Not Statistically Significant, — Strong Negative Movement/Statistically Significant. The University of Pittsburgh Medical Center is the leading healthcare system in western Pennsylvania and one of the largest nonprofit integrated healthcare systems in the United States. UPMC enjoys a strong national and international clinical and research reputation. It is the only academic medical center in the region, and with more than 35,000 employees, the system is the largest employer in western Pennsylvania. UPMC has been ranked among the “best of the best” in U.S. News & World Report’s hospital ranking for the past five years. What does “they set a target of 10 minutes for cases to start on time” mean? Does that mean a case would start, on average, 10 minutes late? ?